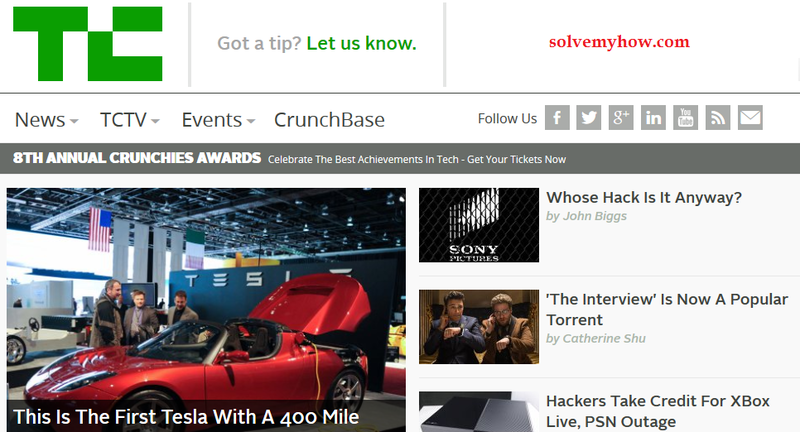 TechCrunch secures the 1st position in top 10 blogs sites and that's why its a no. 1 richest blog in the world. It was founded in 2005 by Michael Arrington and he's the highest earner blogger in the world. TechCrunch blog is about latest technology news and information on startups. This is the one stop destination blog if we particularly talk about technology. So, if you are technology lover then you will definitely love this blog. TechCrunch also post about news, gadgets, mobile, enterprise, social, asia, europe, etc. TechCrunch is the no. 1 technological blog in the world since 2005. If you need help in business startups then TechCrunch is the perfect place for you. The categories I mentioned above are just the few. You can visit this blog and read all the categories. The have one separate page of catergories for A to Z.
TechCrunch has huge social media fan following and it has team of excellent technological writers. TechCrunch updates so frequently that you will get minute to minute updates about tech news. It it updated with almost 250-350 posts daily and this makes TechCrunch the no. 1 blog on the internet. In 2010, TechCrunch was acquired by AOL and is now one of its leading power brands. The earning of TechCrunch is about $520,000 to $700,000 Per Month. I've analyzed this site and founded the data mentioned below in the tabular format. Some estimated data is shown in the above table. Most of the traffic and earning of this site is coming from USA. Look at the snap shot below. Michael Arrington has become the great personality in technology field. He's the founder and CEO of no. 1 technology blog TechCrunch and that's why he is the highest blogger earner in the world. His sense in business is amazing. He recruited very smart people for TechCrunch who are working day and night to maintain TechCrunch position. The Success of Michael was firstly seen when he founded this blog in 2005, TechCrunch was getting 37 million page views monthly. In 2008, Michael Arrington was recognized by Time Magazine as one of the World's 100 Most Influential People. TechCrunch is soon going to complete a decade. I have started a blog and i want some inspiration. Is it worth giving time in building a blog to earn money ? And how much do u earn ? Can u please guide me ? please do reply. In blogging profession you need patience. Traffic and earning is not sudden thing. Write passionately, you will definitely make some good money from it. Don't just write to earn money, write because you love writing. Just make one blog and start writing. Our Blogger Category will help you in growing traffic.